In enterprise application the requirement for single sign on is common: Users are already authenticated against the domain controller - they don't want to jump through another authentication hoop to get access to your particular application. 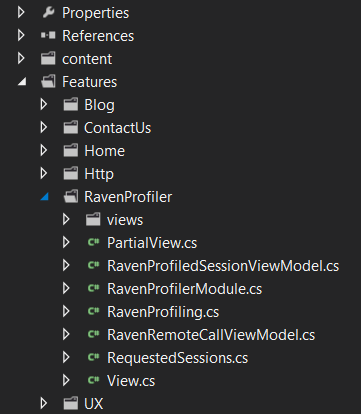 Setting this up in ASP.NET using WIF is some pretty easy web.config gymnastics and described elsewhere. The result of this setup is that the current principal on authenticated requests is a ClaimsPrincipal identifying the user in terms of the claims setup for him/her in the identity provided (e.g. your organizations Active Directory). There's a bit of a problem here. What does Exception Reporting have to do with Validation? Or the Home Page? Mostly nothing, other than these classes perform the same kind of function. Wouldn't it be easier to organize everything by feature instead? 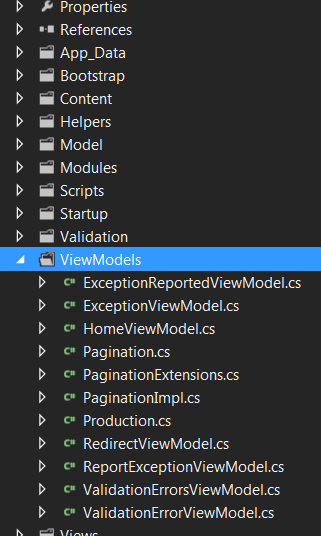 Views, View Models, scripts, stylesheets, everything? There are many markdown blogging engines out there such as Calepin, Scriptogram and even WordPress allows you to write blog posts in Markdown but Sandra.Snow tries to add something different. Firstly, it is written in .Net and Nancy, secondly its a static blog generator and finally it supports Git deployment. Even if you don't want to use Git deployment you can use FTP, its a great tool. To write your blog post in Markdown you need a custom header in your file so it knows some information about your post. After a quick six month writing and editing process my Nancy book is published. It's available as e-pub, mobi, pfd and dead trees via the publishers site as well as Amazon, Amazon UK, and Safari. Well, it about the Nancy web framework. Nancy is an awesome .NET based web framework that focuses on being both easy and fun to work with. 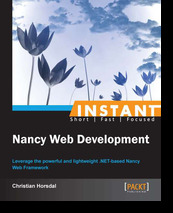 Nancy lends itself to writing highly testable web application with simple, concise and readable code. Who doesn't want that? The book starts from the very basics of getting Nancy up and running, but quickly moves into more interesting areas including dependency injection, hosting, content negotiation, authentication, async processing and more. I don't know about you but all I hear is "ASYNC ALL THE THINGS! ", I think this is partly down to its new and shiny and us developers love "the shiny" and partly a lot of the things we do in our applications are I/O based whether that be database or file system. The problem that comes with the new and shiny bandwagon is you need to understand what you're evangelising. Making asynchronous methods and executing them with no actual reason will not give your codebase any gains and could actually effect your application's performance. There is more depth to that argument but for simplicity just remember this, only use asynchronous methods if you are doing some sort of I/O. About a year ago I made an attempt to wire Nancy together with RavenDB and failed miserably. Needed a break from businessy coding last night so I decided to work on something fun instead. The ability to see what's going on in your application is so important when it comes to performance tuning. Yes, there's that old adage about premature optimization. IMO this phrase is taken out of context. To me 97% of the time means 97% of the code in your face, which is doing stuff in memory. The other 3% of your code is doing I/O of some sort. Minimizing the use of I/O will provide the biggest performance gains for most applications. The video of the talk I did on Nancy at NDC is out. The talk me writing some Nancy code, talking a lot about Nancy and at the end I have a simple todo application. In Part 1 of this series we looked at putting NancyFX as a simple http wrapper in front of YouTrack. Now we're going to make it more RESTful - i.e. we will display the error page to the user agent and include the exception report form on that page.